We typically share the contributor bios at the end, but Tiffany Frances has such a dazzling background, we thought we’d open this Q&A with a little bit about her. 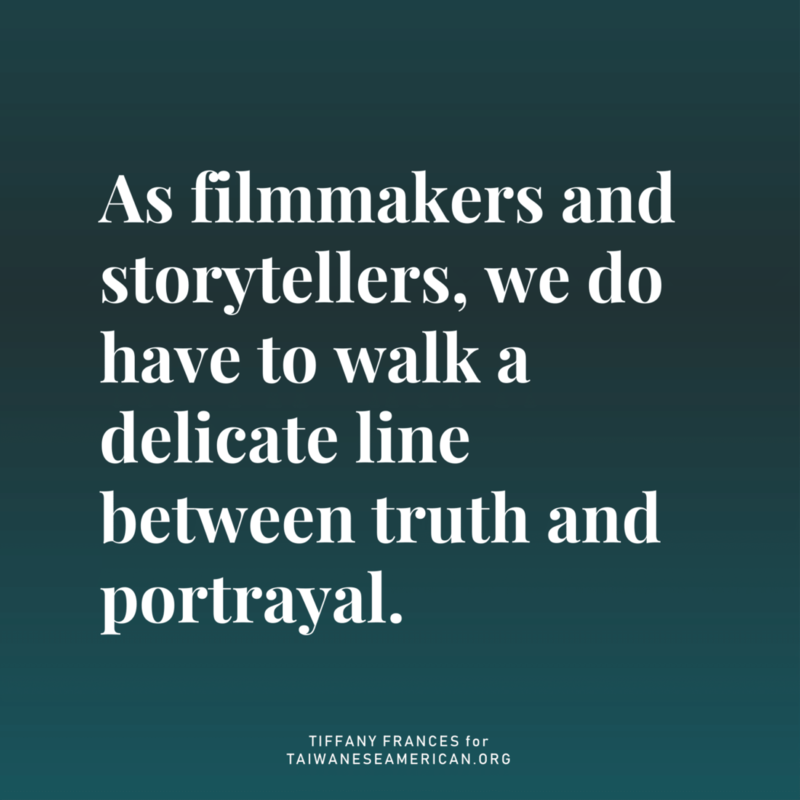 Tiffany Frances is a Taiwanese American director and writer working in music videos, branded content and narrative film. She was selected for SHOOT Magazine’s 2018 New Directors Showcase, where a trailer of her short film, WHAT I WISH YOU SAID, screened at the Directors Guild Theater in New York. Her short film MOVEMENT for National Geographic garnered over 1 million views on Facebook, while her short film A COOL DARK PLACE was the official selection at La Femme Film Festival, International Film Festival of Cinematic Arts and Brooklyn Girl Film Festival, and a finalist for Best Short Drama at the New Filmmakers LA Film Festival. Other projects have screened at Nitehawk Shorts Festival, Brand Film Festival and Berlin Fashion Film Festival. Her film work and photography have been featured on Paper Magazine, Ladygunn, Stereogum, The Fader and BlackBook Magazine, among others. Her producing credits include commercials for Barney’s and Red Bull, music videos for Toro Y Moi and Killer Mike, while her directing clients include National Geographic, Dia & Co, Tanya Taylor, Citibank, Acura, Montiel and Jonesy. In her film work, she is committed to bring a voice to women, and the under-represented. She believes strongly in contributing to the Asian American community; more specifically, highlighting Taiwanese American stories. She loves bringing new, fresh ideas to life visually, and challenges herself to think about film in avant-garde styles. She enjoys working with different mediums, from Super 8mm to high-end digital cinema cameras. Hi Tiffany! Thanks for taking the time to chat about HELLO FROM TAIWAN. Thank you so much for your time also Leona, I appreciate TaiwaneseAmerican.org and its mission to highlight Taiwanese America. So you were one of eight selected filmmakers out of 280 that applied for the prestigious American Film Institute’s Directing Workshop for Women. Congratulations! What does this opportunity mean to you? This is an amazing opportunity and I’m truly so happy to be a part of it! The program is specifically designed to increase the numbers of female directors working professionally in narrative film and television. Each step of the workshop, whether it’s a class, method of going about our project, mentor, or event, is to gear us towards jump-starting our directing careers. Simultaneously, I’m also incredibly inspired just to be in the presence of these other women and the people guiding us. For one, it means this project I’m making is supported by the right people and the best intentions, and that’s not always easy to find. Also, sisterhood is powerful, right? To be doing this alongside other passionate, talented women is such a great feeling. We had a weekend writing workshop last month, and it was fun hearing brilliant ideas being tossed around between a group of women. That was really something. That’s amazing, and so well deserved. I’ve taken a peek at the script – which is lovely, by the way – but could you tell our readers about the storyline? The storyline is based on one of my earliest memories as a child. I grew up the youngest of 3 sisters in San Jose, CA. After a year of separation from my two oldest sisters and my dad, who were living in Taiwan, my mom and I went to the airport to go pick them up. Re-meeting them at the airport at age 4 was jarring – there was a shift of culture between us, and I was confused why we had been separated in the first place. And that’s where HELLO FROM TAIWAN begins – we open on a scene of a Taiwanese-American family reuniting at the airport in 1989. The film then goes on to explore the following weeks as the family struggles to reconnect. It is told from the point of view from the little girl at age 4, so the story unfolds from innocence to understanding how the world around her works. So it sounds like this film is almost a direct reflection of your own family. Have they read the script? How do they feel about the way they are depicted? Was it challenging for you to write about these characters? This is a good question, because I’ve been wrestling with this. As filmmakers and storytellers, we do have to walk a delicate line between truth and portrayal. I wrote the script over several years and it was just the scene at the airport for a long time. It took me a while to even get to the point of why I wanted to write this, and what the theme of the film was. In the last year of fleshing out the story more, the characters’ development have taken a life of their own. So I tell my sisters and my mom as I go through rewrites: “I would love your input, but don’t take this too personally! These characters aren’t you, I promise!” My mom is definitely the most nervous out of everyone – mainly because this is a super personal subject for her. But what was pretty cool is that she started telling me all these stories (hello, gold!) about her and my dad when they were younger, and the struggles they went through raising us. It really gives me a larger palette to work with. What does HELLO FROM TAIWAN do for Asian American and Taiwanese American media representation? When I think about my childhood and navigating American media, I wish there were coming-of-age, authentic Asian American and Taiwanese American stories on my TV, or films I could relate to. I got used to seeing Asian characters as side characters, and usually more often than not they were stereotypes. It took me a while to realize this should not be the norm. I really would like to start seeing media reflect immigrant and Asian American stories as complex and humanistic – and also bring these characters to the forefront. There are so many layers to explore in our tales. My story is just another piece of the puzzle, one tiny step in the grand scheme of Asian American representation, towards understanding our past and present complications and uniqueness. How did you choose to frame this segment of events — how it begins, where it ends? Were there any moments that were hugely significant for you, but didn’t make it into the final script? It was in the past year or so that I started thinking about developing this story into a television show around the family as a whole. So I’ve had a larger perspective of what events and character evolution would happen in the long run. However, this being in a short film format means I have to be strategically succinct, which made me focus on the youngest daughter’s perspective much more and tell it directly from her view. The way I structured telling her story, was starting at her entire world getting shaken up. At 4 years old she is living only with her mom, attached to the hip, used to having her all to herself. When the sisters and dad come into her world, she struggles to understand why they are breaking up her harmonious world. She then goes through this chain of events to find out that she really what she needs is the love from rest of her family as well. How did you arrive at filmmaking as your creative medium? I’ve always held a variety of interests throughout my life; I play music, I love taking photographs, I was involved with theater since high school. It was during my undergraduate studies at UCSD that I started taking film classes. Learning film theory and history made me understand it as a medium that was highly influential and even pervasive to society. As I experimented with it I realized it was the most all-encompassing medium for me. It’s not just storytelling; it’s melding music, sound design, time, composition, color, movement, acting, performance, art. Not to mention environments and clothing and hair and makeup! Bringing all elements to the table and weaving it to create an experience, is an incredible challenge but a rewarding one. We always ask writers what their favorite books are; are there any films that were particularly evocative for you? Who/what are your creative inspirations? I’m inspired by daily life; pulling from my experiences and also what I encounter on a personal level. In terms of film – this is a hard one! I was really influenced by French New Wave cinema when I started observing film in an academic setting. Satyajit Ray’s The Apu Trilogy was really striking to me. As I continue to develop my style as a director, I’m finding South Korean and Female Filmmakers to be really mesmerizing – yes, with a capital F. I love new voices emerging these days such as Issa Rae, Alma Har’el and Crystal Moselle. Do you have any advice for young, aspiring creatives? Never let anyone stop you from creating. Always allow for experimentation and give yourself space to be true to yourself. You know your intuition the best; listen to it and don’t let it get buried under the noise of society. How can we support HELLO FROM TAIWAN? I have a crowdfunding campaign at Seed & Spark to raise funds for this film! And we need the support of our community to make it happen.